Enjoy new and improved Come on Baby! The description of Come on Baby! Come on Baby, the star of arcade sports game has debuted on the smartphone! Decide the strongest baby through 6 upgraded sports events! Shake your head and get rid of octopuses falling on you head! Shake it Shake it! Will you get shocked or survive? Electrifying jump rope! Make sure you don’t lose your balance or you will fall! The prince of balance! Pull rhino’s tail and send it flying! Shoot the Rhino! Who’s the fastest baby? 100M Crawling Race! No. 1 battle action! Face Slapper! All sports events can be enjoyed on online real-time battle! 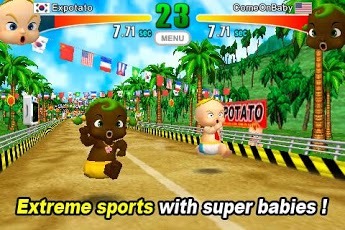 Enjoy super comic sports events of super babies with players all over the world! 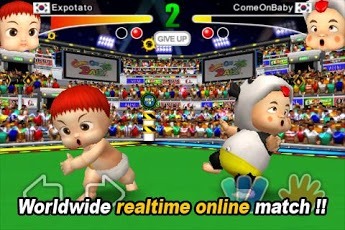 - Match up mode which allows you to play online real-time battles against the super babies throughout the world! - Arcade mode where you can obtain experience from endless enemies! - Challenge mode for challenging better record!- Training mode where you can train to become the world’s strongest baby! ✔ Support battles with Bluetooth! You can have quick match with a friend beside you even if there’s no network! ✔ Exciting missions and great rewards! ✔ Links to the Facebook! OTHER VERSIONS Come on Baby!